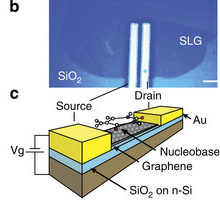 A research team led by Steven Prawer and Jiri Cervenka at the University of Melbourne, Australia fabricated a graphene field-effect transistor (GFET)—a layer of graphene atop a layer of silicon dioxide and flanked by gold electrodes. Then, under vacuum, they deposited a thin monolayer of isolated DNA nucleobases and measured their impact on graphene’s electrical properties. The data indicate that under these very specific conditions— depositing billions of identical molecules in bulk, in a vacuum—the device was sensitive to the DNA bases, producing distinct changes in electron flow through the graphene layer for each of them. According to Cervenka, now a research fellow in Prague, Czech Republic, that observation should empower researchers pursuing graphene-driven sequencing approaches, and suggests that GFETs have potential to function as molecular sensors. Cervenka’s motivation for the study came from discussion in the scientific literature on the feasibility of using graphene as an electrical detector for nanopore-based sequencing. It was already known that graphene—a two-dimensional carbon lattice shaped like a honeycomb or chicken wire— could be used to detect certain gases. The question was, could it differentiate DNA bases. “And the answer is yes, it’s possible,” Cervenka said. But the device his team fabricated functioned in a vacuum, not in liquid, as is typical with DNA sequencing. And when the team calculated their device’s sensitivity for single bases, they found that it did not pick up adenine. Dontschuk, N, et al., “A graphene field-effect transistor as a molecule-specific probe of DNA nucleobases,” Nat Commun, 6:6563, 2015.